Corresponds to EN 1677‑4 with higher load capacity. For pewag Connex and welded System. 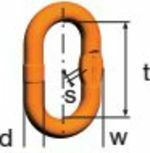 Intermediate link or transition link and securing link.